Scotmid Co-operative announced the latest winners of its popular Community Connect initiative this week with nine local charities receiving a share of £75,000 funding generated from the sale of single-use carrier bags. 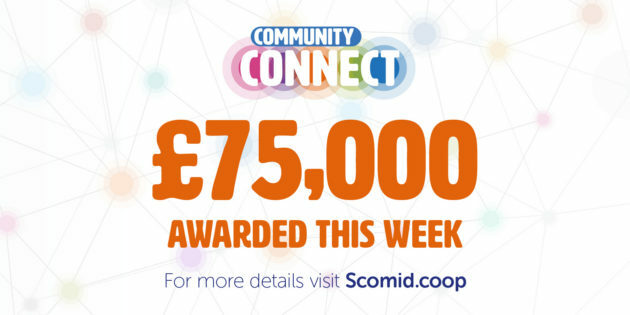 Launched last year, Community Connect is a popular membership and community initiative from Scotmid, which enables members to vote for good cause groups in their local region with up to £15,000 funding being awarded every six months to the charity that earns the most votes. Every member in all of the Society’s Scottish regions, North, West and East, were given a Community Connect card and each time they shopped in a Scotmid store and scanned their card they were allocated one vote which they could then cast either in-store or at the regional member meetings at the start of October. Laurencekirk Memorial Park were awarded £15,000 Community Connect funding after coming out on top in Scotmid’s North Member Region. The Aberdeenshire-based group will put the funding towards improving the park, including plans for a unisex, disabled access toilet to be constructed. Laurencekirk Memorial Park’s Peter Reid said: “This is fantastic news for the Memorial Park and the funding of £15,000 from Community Connect will help us to bring our plans to life. St Andrew’s Hospice were awarded £15,000 Community Connect funding in Scotmid’s West Region and the charity provides specialist palliative care to patients with life limiting illnesses in both North and South Lanarkshire. The funding will go towards purchasing a new minibus, which enable the hospice to transport patients to their outpatient appointments which include physiotherapy, complimentary therapy, adult bereavement sessions and children’s drop-in services. Blood Bikes Scotland received the £15,000 Community Connect award in Scotmid’s East Region and the South Queensferry-based charity provide a professional, free and urgent courier service to Lothian and Borders hospitals and trusts. Scotmid Co-operative President Harry Cairney said: “Congratulations to all the Community Connect award winners. “As a Society, our core purpose is to serve our local communities and improve people’s everyday lives and Community Connect helps us to achieve those goals. “The way Community Connect works is that is our members, who shop in our stores and live in our communities, ultimately decide where the awards go and then they can see worthwhile projects brought to life thanks to the funding. East Lothian’s Harlawhill Day Care Centre, Lanark’s Esteem Clydesdale and Pillar Kincardine were awarded £7,500 in their respective regions, while West Lothian’s Broxburn Family Centre, Equitots Lanarkshire Interest Company and Inverness Foodstuff walked away with £2,500. In addition to Community Connect, Scotmid Co-operative’s Community Grant programme continues to grow in importance and popularity – last year over 1,000 local community groups applied and were awarded a grant of up to £500.